In the United States, the most common way to stay comfortable indoors is through forced heating and cooling systems. As we’ve emphasized in the past, air filters are a crucial component to the overall function of your HVAC system. Air filters must be replaced regularly in order to keep your heating and air conditioning units working efficiently. It is also important to get the right air filter for your system. When searching for the right replacement filter, there are a number of things to consider. You may think that the brand of the filter matters, however, the best choice is the filter that removes the most pollutants (MERV rating) while allowing your HVAC system to perform efficiently. The following are some sommon misconceptions about air filters that will help you better understand their importance. Granted, as this was the original purpose of HVAC air filters, they’ve come to serve an even more important purpose: filtering out airborne contaminants and particulates from the indoor air we breathe. In other words – improving your Indoor Air Quality (IAQ)! If air filters are not cleaned or replaced regularly, they become ineffective which can lead to a multitude of problems. A neglected air filter that is not cleaned/replaced on a regular basis will become clogged with large amounts of airborne particles until it is completely blocked and the dust/mold is forced back into our indoor air. 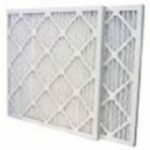 Dirty air filters also restrict air flow putting strain on your HVAC equipment, therefore increasing your energy bills. Make sure you check the your filter monthly and clean or replace it according to the manufacturer’s directions. For the best results, change your air filter every 30 days! If you own a pet, you may need to change the air filter up to twice as often, especially if you have multiple long-haired breeds. Pet hair and dander is an allergen found all over and throughpout homes with pets and can build up quickly, thus reducing the efficiency of the air filter. Try using free-standing room air cleaners to add extra filtration to rooms where your pet is located most often and high-efficiency pleated air filters to keep your indoor air as clean as possible. When choosing between air filters, the first thing to understand are MERV ratings. MERV stands for Minimum Efficiently Reporting Value and it is this number that tells you the effectiveness of your chosen air filter. MERV ratings are calculated by measuring the number of particles a filter can trap compared to the number the particles its trying to filter. Basically, this means that if there are two filters in the same room, the one that traps fewer particles has a lower MERV rating. However, if you simply choose by selecting the filter with the highest MERV rating, then you may be purchasing an air filter that can make your HVAC system less efficient by blocking too much of the air flow and eventually causing equipment damage, plus higher energy bills. The best choice is the filter that removes the most pollutants (MERV rating) while still allowing your HVAC system to perform as efficiently as possible. If you insist on using high-efficiency air filters, it may require some HVAC system modifications in order to increase the fan output to compensate for the restricted airflow. As stated above, if you choose a filter with the highest MERV rating (meaning the highest efficiency) that isn’t meant for your particular HVAC system, you could be making it less efficient by blocking too much of the air flow. Air filters with a MERV 8 filter could require this modification if your furnace came with a MERV 4 or lower filter. Each air conditioning system or HVAC unit has a certain sized filter that allows the filter to perform both correctly and efficiently. The filters don’t need to fit with an “air tight” seal, but you should be able to easily install and uninstall your filter without a struggle. Your filter should be a bit smaller on each side of the filter housing slot, allowing you to slide the filter in and out with ease. For most systems you can use a standard sized filter within 5/8 of an inch smaller than the air filter housing. Most AC and HVAC units use standard sized filters, but some do require a custom size air filter to be purchased and installed. 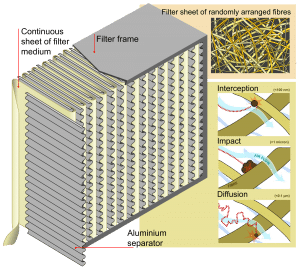 Why is the filter size important? According to EPA.gov, incorrectly designed or installed filter frames can cause air seepage, which significantly decreases filter effectiveness. Plus any air flow resistance caused by using a filter that is not correctly sized can result in unnecessary stress on you HVAC unit, potential damage to your AC system and increase your energy bills. Air filters may seem like something that you don’t need to keep in stock at your house, but if you stick to changing it monthly, the day sneaks up on you. Therefore – it’s wise to stock up. Buy a whole box of air filters. That way, you have a stockpile available when the time comes to change the filter. It’s easier to keep up on this task if you don’t have to make a trip to the store in order to change the filter. We’ve outlined a few of the most common misconceptions when it comes to air filters. That being said, remember that one of the most important things you can do on your own to take good care of your expensive heating and air conditioning system is to simply change your air filter on a regular basis. 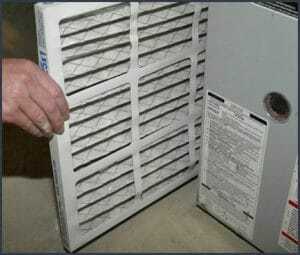 The air filter in your unit is often one of the least expensive and easiest items to change. Additionally, replacing a dirty or clogged filter can have an immediate positive effect on the operation of the unit and its ability to keep the air in your home at the desired temperature without causing unnecessary strain on the moving components. 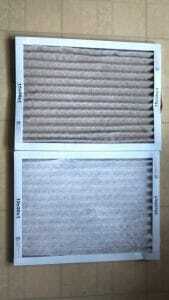 A clean, fresh filter right before the approaching hot summer months will get you off to a great start! US Home Filter offers FREE SHIPPING on any order! Replace my AC or HVAC unit? How do I know? Summer is approaching which means that your HVAC system is going to be working overtime. Air conditioning systems are one of the largest investments we make for our homes, so of course you want to get the most out of yours, right? Even if you keep your HVAC system well maintained, plus clean and change your filter regularly, it’s going to have to replaced at some point. Older or damaged HVAC systems can result in increased energy bills and poor indoor air quality (IAQ). The good news? Newer HVAC systems are up to sixty percent (60%) more efficient than most of the older models – saving you money in the long run. But while installing a new HVAC system is a terrific (yet pricey) investment, most homeowners will only get a new system when the old one stops working. But is that really a good idea? Or are there signs to look for letting you know its time to be replaced? Do you even know when your HVAC system was installed? According to the Department of Energy, air conditioning systems should be replaced every 10-15 years. Although durable, the major components of any HVAC system will begin to deteriorate after around 10 years (dependent obviously upon how often they’re used and how well they’re maintained). Systems that are over 10 years old also use a type of Freon (R-22) that is not only outdated, but also is extremely harmful to the environment. When a newer unit is installed, you will not only lower your energy bills but also help to reduce your carbon footprint on the environment. 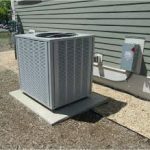 Many times as an AC unit is going and growing old, you’ll find yourself having to pay for frequent repairs to the system and eventually replacing some of the major components. When that starts happening, it’s time to see if replacing parts is really going to be saving you any money in the long run. If the repair costs are greater than half the cost of a new system, then it’s time to be “out with the old and in with the new”. Purchasing a new system will be a smart investment, saving you money in the long run, as well as reducing your immediate energy costs. It is normal to expect increases and decreases to your energy costs as the seasons change, but each individual month should be relatively the same compared to the year before. If you have unusually high energy bills in a month where it’s not expected, it is a sign that your HVAC system needs to be serviced and possibly replaced – the older the system becomes, the less efficient it becomes. Regular maintenance (especially changing your air filters monthly), will increase the life of your HVAC system and keep it running efficiently as possible… but at some point you will need to upgrade it to a newer system. The good news is that installing a new air conditioner can cut down on your total energy bills by as much as 20%. Many people find that over a relatively short period of time their new AC unit has actually paid for itself! 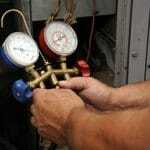 An old HVAC system will have problems keeping your house at a consistent temperature. It could be a maintenance issue (e.g. a damaged or inaccurate thermostat, low fluid levels, cracked ducts, clogged filters, etc. ); however, temperature inconsistencies usually mean that your AC system is either not powerful enough or that the duct work is not properly installed. Either way, keeping an HVAC system that is not working properly and efficiently is going to result in an uncomfortable home environment and much higher energy bills. In addition to providing you with cooled or heated air in your home, your HVAC system is also responsible for providing proper ventilation. When working properly, the system should improve your home’s IAQ (indoor air quality) by removing dust, dander, dirt, and other debris and by controlling the humidity. If you are noticing an increase in the amount of dust in your home, it could be a sign that your air conditioning system is no longer operating efficiently enough to remove it. If you notice an unusual smell coming from your HVAC system, it could be just dust burning off; however, it could be something much more serious, such as melting wiring or mold in the ducts. If it is a more concerning odor, turn off your system immediately and get it inspected right away. A properly working HVAC system should also be relatively quiet. If you hear noises that sound like grinding or squealing, this is also a sign that you need to have your system inspected immediately. Your air conditioner is the biggest factor when it comes to your homes indoor air quality, especially during the summer. The air conditioning unit may be damaged if you notice mold, mildew, dust or unusual humidity levels and all may be signs that your system should be replaced. Always keep in mind that a NIOSH (National Institute for Occupational Safety and Health) research study concluded that over fifty percent (52%) of Sick Building Syndrome cases could be traced back to inadequate ventilation! Tag: Do I Need To Replace My AC Unit? Taking care of your HVAC system to keep it running efficiently is an important item to include in your home maintenance plan every spring and fall. While there are some tasks that should be saved for a professional HVAC service company, there are several tasks that you can easily perform on your own to prolong the life of your system. Take a look at our Maintenance Checklist below for an overview of the types of things you can do to help take care of your unit as well as those items that should be completed by a qualified technician. Clean the evaporator drain line – Warm, moist air travels through your evaporator coil. The heat is absorbed in the coil which cools it and circulates it back into your home. This process can create a humid environment which causes condensation on the coil that falls into a drip pan. A drain tube, usually about 1 inch in diameter, then carries the water into a floor or sink drain or sometimes the tube drains outdoors. A buildup of mold or algae can eventually cause a blockage. The drain tube can be cleaned by using a wet/dry vac, a plumbers snake, a garden hose, or by pouring distilled white vinegar through it. Turn off water supply to the humidifier unit – Because of the humid environment created near the coil, it is recommended to turn off the water supply to your humidifier during the months when you are using your air conditioner. Some humidifier units are equipped with a Summer setting that will allow you to simply turn a knob to that setting to deactivate the humidifier for the season. Change the air filter – this is one of the easiest tasks you can do to keep your HVAC unit running at peak efficiency. Spring is the perfect time of year to change your air filter out since your system has likely been working hard over the previous winter months. Changing your filter now will give you a fresh start to the upcoming summer months, getting you started with a clean filter to allow your system to cool your home with ease. If spring allergies are a concern, we recommend our MERV 11 high-efficiency pleated filters to capture mold, pet dander, pollen, dust mite debris, and other contaminants. Clean the area around the condenser unit – You will likely have some debris that has collected around the base of the unit over the past few months. 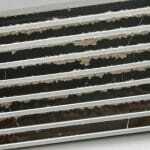 Leaves, stick, dirt, grass clippings, and other items commonly gather up against the unit. Sometimes, the exit for the ducting of the dryer vent will lead right into the side of the condenser unit. It is important to keep the condenser and the surrounding area clean and free from any type of debris. Clear away any buildup of debris and trash as well as trim back vegetation and branches within a minimum of 2 feet around the unit. Clean the condenser unit – Remove the outer cover or grate that covers the outdoor unit. A shop vac can be used to remove any debris on the outside of the unit. A garden hose can be used to spray the fins from the inside to wash away any built-up dirt on the fins. Coil cleaner may also be applied ahead of rinsing for caked-on debris. Inspect and straighten fins – Condenser fins are positioned on the covering of your condenser unit outdoors. 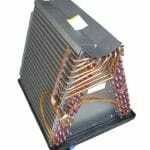 These function similarly to the fins on your evaporator coil by assisting with airflow and heat extraction. The fins are usually made of aluminum and are thin and easily damaged. When damage occurs, it disrupts an open path for air to freely flow and can adversely affect the efficiency of your unit since it will have to work harder. Here is a quick video with some easy instructions on repairing bent compressor fins. 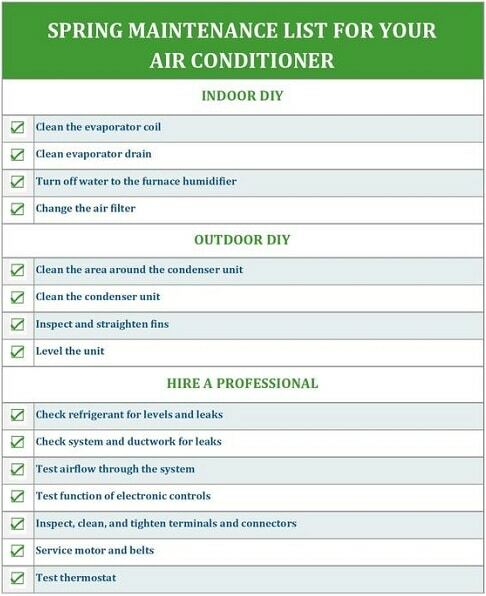 Level the condenser unit – Having a condenser that is level allows your unit to function properly. Not only is it unsightly when the condenser pad is sinking off to one side, it also causes the lubricating oil to separate which can interrupt the flow of refrigerant through the system. It can also cause strain on the coolant lines leading to your home. A few simple items are usually all it takes to level the unit. One of the most important things you can do on your own to take good care of your expensive heating and air conditioning system is to simply change your air filter on a regular basis. The air filter in your unit is often one of the least expensive and easiest items to change. Additionally, replacing a dirty or clogged filter can have an immediate positive effect on the operation of the unit and its ability to keep the air in your home at the desired temperature without causing uneccessary strain on the moving components. A clean, fresh filter right before the approaching hot summer months will get you off to a great start! At US Home Filter, we appreciate each and every one of our customers. We are here to help you choose the best solutions for your individual needs. Whether you need help with one of our standard stock size air filters, a Whole House Air Cleaner replacement filter, Grille filters, or if you are overwhelmed by choosing the right custom size air filter, we will be happy to personally work with you to help ensure you order exactly what you need! Call us today at 1-855-237-1673! 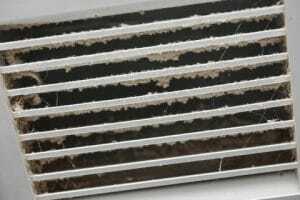 Air duct cleaning is something that has grown in popularity over the past several years. This service can be offered by a variety of companies including those that specialize in HVAC service and repair, cleaning services, restoration, or those that focus completely on cleaning air ducts. The ductwork in our homes and businesses is nicely tucked away, but many of us would be surprised to see what the inside spaces of the parts that make up this system may actually look like. There are diverse opinions either way regarding the necessity of duct cleaning, but those that suffer from allergies and have issues with excessive dust tend to be most receptive to the idea. Because it is a relatively recent process, no scientific studies have been able to prove that it will prevent illness and there are no findings available to show a measured improvement in air quality or a reduction in air particle counts. This article will outline the basics of ductwork, discuss what is involved with professional duct cleaning, and provide information that may help you decide if having your ducts cleaned is a good option for you. The methods used to perform cleaning can vary slightly, but standards have been established by the National Air Duct Cleaners Association (NADCA) to help ensure consistency across all providers of this service. Generally, you will first have an assessment of your ducts and HVAC system components listed above which will be similar to an inspection to determine the condition of your system and advise whether a cleaning is recommended or not. During the cleaning procedure, industry-specific tools are utilized to remove built-up dust and debris from the system and ducts that run through walls, under floors, and over ceilings inside your home – all in places that are nearly impossible for us to reach on our own. Then the loosened debris is vacuumed out, leaving behind a shiny, clean interior and the satisfaction of conquering those filthy ducts. What Is Used to Clean Ducts? There are various pieces of equipment, tools, and devices that duct-cleaning specialists will make use of when performing this service to your HVAC system. Inspection Tools – items used to assess the level of debris that has collected inside the areas of the system that can be treated. These items can additionally be utilized to maintain a watch over the progress of the cleaning procedure and to determine if the results meet the desired expectations. Examples of these tools include mirrors, periscopes with lights, and cameras. Compressed Air Devices – used in conjunction with many pneumatic tools that require direct air pressure. This usually comes in the form of a compressor. Vacuums – specific vacuum devices are designed for use in air duct cleaning. Portable and truck-mounted units are both acceptable and approved by the NADCA. Either type of unit will create a negative pressure in the ductwork to maintain control over the flow of debris. If there is a need to extract moisture from any areas, a wet vacuum may also be used. Access Tools – used to create an open path to various areas that are otherwise unreachable. Entry points are made using drills and saws, as needed, to allow equipment to successfully remove debris and clean the system. Whenever possible, access is made through diffusers, return grilles, vents, and duct end caps in order to avoid creating unnecessary openings. Imaging Tools – these are used as inspection devices and also throughout the process to evaluate the results. Handheld cameras, CCTV cameras, and even remotely-operated mobile cameras that move through the ventilation as the process occurs can all be used to provide a clear view of the work performed. Chemicals – cleaners and disinfectants may be recommended in some cases. These would include such things as biocides to kill bacteria and mold and sealants to repair leaks. Any chemicals or sanitizers used must be registered by the EPA. The NADCA provides a guide that discusses the use of chemicals related to duct cleaning. Unfortunately, this is something you will need to watch out for. The best thing you can do to protect yourself is to do your research before choosing a company. Here are a few pointers you will want to consider. Verify membership with the NADCA. Many companies falsely claim to be members. Click here to see what NADCA says about why it is important to choose a verified member of the organization. Cheap offers that, once in your home to perform the job, will convince you to do a “mold inspection” only to determine that you have a mold problem that they will offer to take care of for additional charges. This is commonly done to cover costs of coupon or discount deals. If you are concerned about mold, hire a reputable company that specializes in mold testing. Low-cost “blow and go” service. These are the offers you see for a small fee per vent or a whole-house package at a cheap price. These inexpensive offers almost guarantee some type of added suggestions for other services, as in the mold treatment discussed above. Watch an example of an undercover story by Inside Edition on this type of scam in action. Now that you are familiar with the basics of air duct cleaning and armed with a few helpful tips of caution, you will want to ensure that you have done the following before making a final decision. Create a preventative care list that includes yearly inspection of your heating and cooling system, regular changes of the system air filter, and steps that ensure you prevent moisture from getting into the system. At US Home Filter, we enjoy helping our customers solve filtration issues and we are here to answer your questions about your indoor air quality and allergy concerns. We recommend our highest-rated MERV 13 pleated filters for your home or business if you are looking for the highest level of air quality and suffer from severe allergies such as those that can be triggered by your loving pets. Whether you need AC or furnace filters, a specialty Whole House filter, a Grille filter, or even a custom air filter size, we have a professional and helpful staff ready to take care of you! Have you ever heard the term “Sick Building Syndrome”? Just by the name alone, you can conclude that it has something to do with being in an unhealthy indoor environment. Sick Building Syndrome, or SBS, is a medical condition where people in a building suffer from symptoms of illness or feel unwell for no apparent reason. Those who spend the most time in the unhealthy environment are the ones most effected with symptoms such as tight chest, wheezing, sore throat, eye and nose irritation and in some sever cases, dizziness and nausea. But what makes a building ‘sick’? The causes of SBS are usually linked to flaws in the heating, ventilation, and air conditioning (HVAC) systems. The amount of fresh air that is brought indoors is extremely important. Shockingly, a NIOSH (National Institute for Occupational Safety and Health) research study concluded that over fifty percent (52%) of SBS cases could be traced back to inadequate ventilation. When central air conditioning and heating systems first began to be installed in buildings, building ventilation standards called for approximately 15 cubic feet per minute (cfm) of outside air for each building occupant. Then came the oil crisis in the early 1970’s which reduced the ventilation standard to only 5 cfm in order to save energy. And it did. However, the health of the building occupants suffered and people started getting sick in droves. Thankfully, 20+ years later, the American Society of Heating, Refrigerating and Air-Conditioning Engineers (ASHRAE) developed a ventilation standard that balanced adequate ventilation and energy efficiency to prevent sickness. Now we are back to a minimum of 15 cfm of outdoor air per person and 20 cfm per person in office spaces. When there are high levels of CO2 (above 800 to 1000 parts per million) in the air the room can begin to feel ‘stuffy’. However, SBS symptoms can occur at a much lower concentration and anything above 1000 ppm can cause people to become quite sick. Thankfully, this level is very uncommon due to the proper ventilation system requirements as described above. Have you ever stopped to think about all the chemicals that make up the structure of our indoor spaces? Carpet, upholstery, paint, adhesives, copy machines, cleaning agents, etc. are all a part of our everyday lives and they bring an abundance of unhealthy chemicals into the air we breathe. These toxins include volatile organic compounds (VOCs), e.g. formaldehyde, which cause chronic and acute health effects at high levels. Outdoor air that enters into a building can be a factor in indoor air pollution. While adequate ventilation is required, the type of air that comes inside is equally as important. If you’ve ever driven on a toll road, did you think about all the exhaust fumes the toll road workers are exposed to? Or the drive-through operator at a fast food restaurant with the window open while idling cars wait for their food order. Outdoor contaminants can also come into a building if the air intake vents are poorly located and polluted air is sucked into the building instead of fresh air. Mold, bacteria, viruses and pollen are all examples of natural toxins and they can grow if your HVAC system isn’t properly taken care of. If there are standing pools of water near an HVAC unit, mold will begin to grow, especially as outdoor temperatures rise. If there is any water damage inside the building on the carpet, ceiling tiles or insulation, this can also be a cause of mold growth if not properly taken care of. Plants and weeds growing can also cause issues with restricting air flow into a building and pull more pollen and allergens into your indoor air. While the number of benefits that come from using air filters in your home can be outlined in a fairly short and straightforward list, it is a list that contains three very valuable points and will provide you with a full understanding of the true advantages that you can expect to experience from these relatively simple items. Air filters come in a vast number of sizes and several MERV ratings. Despite the extensive differences in size and the many types available, all air filters are designed to fill these main purposes. Although the size you need is basically determined by the size required by your unit and the space allowed for the air filter to be installed in, most will have the flexibility to determine which of the varied MERV ratings will be most suitable to fit their needs for the desired level of dust control and allergen reduction. We begin by discussing the original intended purpose for air filters and the actual reason why they were created. The most common reason for the malfunction or failure of a heating and air conditioning system is a lack of maintenance. Often, the culprit is dust which sometimes builds up on the expensive moving parts of the unit. Once the dust has accumulated to a high enough level, there will inevitably be problems. These problems, when associated with dust, can almost always be easily preventable by regular maintenance. One of the simplest ways to maintain your system and preserve its life on your own is to simply use an air filter that fits properly and change it when it has reached its capacity to hold dust and effectively allow a proper rate of airflow so your home can be heated or cooled to the desired temperature. Providing your Heating and Air Conditioning system with a protective barrier against dirt and debris is the original and primary reason for using home air filters. Air filters, although inexpensive in comparison to the cost of your HVAC unit, carry a high level of responsibility in keeping your system running efficiently and smoothly. Your air filter traps dust and dirt particles before it reaches the internal and moving components of the unit. What parts are contaminated with dust build-up when a poorly-fitting, low-quality, or dirty filter are used? By preventing dust and debris from collecting on the mechanical parts of your heating and air conditioning system, your filter is also working hard to minimize the dust levels in your home’s air. Using a high-efficiency pleated filter provides a great deal of surface area which translates to a considerable amount of dust-holding capacity. 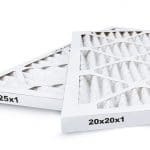 Pleated filters are capable of trapping and holding several grams of dust that would otherwise be blowing through your ducts and back into your air where it would inevitably settle on all those surfaces that we prefer not to continuously dust off. Battling dust that continues to reappear on bookshelves, tables, window treatments, and decor is a constant point of frustration. It is virtually impossible to fully eliminate dust because there are so many sources, but your air filter is a great supporter of your fight to reduce dust as much as possible. We recommend a minimum of a MERV 8 rating on your home air filter for those that need to control average levels of dust, but those that need greater protection from smaller dust particles (fine, suspended dust) would benefit from a higher MERV rating. As you increase the MERV rating you capture finer particles and remove a higher percentage of dust and microscopic particulate matter (PM). It is this subject of filtering fine particles, even as small as attached bacteria and viruses, that leads us into the next benefit which has become a very popular topic of discussion just in the past few years. Although system protection is the priority and dust reduction is a close runner-up, we cannot ignore the importance to many consumers of air filters as they relate and contribute to our indoor air quality (IAQ). This has become increasingly important as it is believed that the average person spends 90% of their time in indoor spaces where concentrations of pollutants are 2-5 times greater as compared to the outdoor levels. Of course we would likely desire the cleanest air in the areas where we tend to spend the greatest amount of time. For those that have serious concerns and have experienced the benefits of having their air as clean as possible, IAQ may feel like the most important factor in air filtration. Of course they likely desire to protect and preserve their system and minimize dust, but those with severe allergies and sensitivities to certain particulates and contaminants often appreciate a quality high-level filter as much as some of the other items they use, such as allergy medication, to lessen the symptoms caused by allergens. A MERV 8 rating is sufficient for those that have mild allergies and sensitivities. We recommend a MERV 11 rated air filter when you experience a moderate level of allergy issues. If you are highly sensitive to particulates, pollution, contaminants and various allergenic elements, you should definitely consider trying a MERV 13 filter which will scrub your air from the finest particles and keep your air as clean as fresh as possible. Choosing the best filters for your home or business can be overwhelming and confusing sometimes. At US Home Filter we understand this, which is why we have an experienced and friendly staff to help answer any questions you may have. For personal assistance or questions about your air filter needs, please contact us now online or call us at (855) 237-1673 and we will do our very best to help you in selecting the perfect filter for your individual needs. We want to earn your business and we guarantee your satisfaction! Take advantage of our quality products, vast selection, low prices, and enjoy FREE SHIPPING on every air filter order within the Contiguous USA.